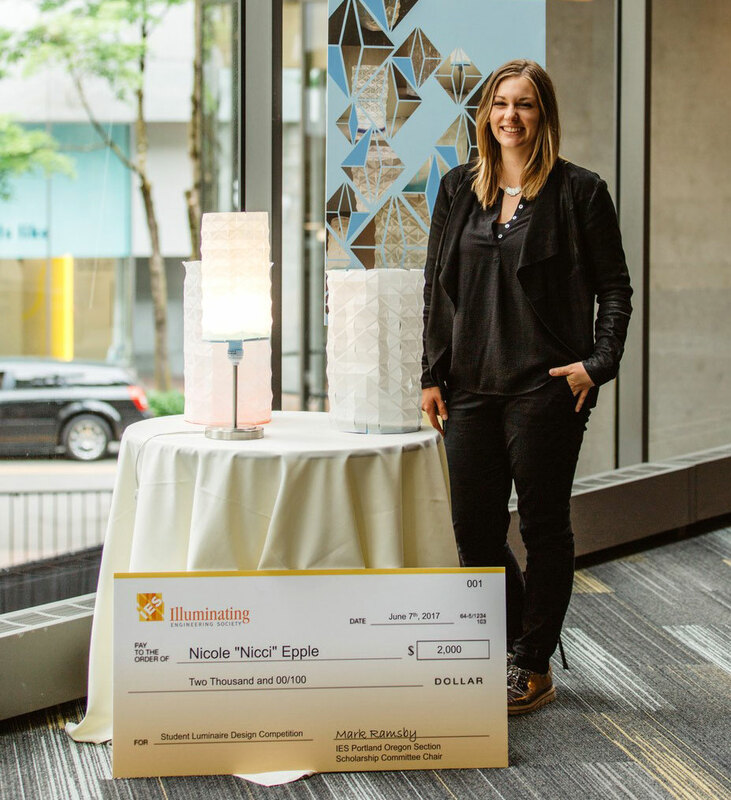 Nicole Epple, an exchange student from the University of Stuttgart, won the 2017 Illuminating Engineering Society of Oregon (IESOR)'s James C. Garber Scholarship for her luminaire design. Her lighting fixture emerged from experimenting with how cut-and-folded translucent paper would interact with boldly colored paper. An initial version appeared to glow due to reflection, without any electrical source. 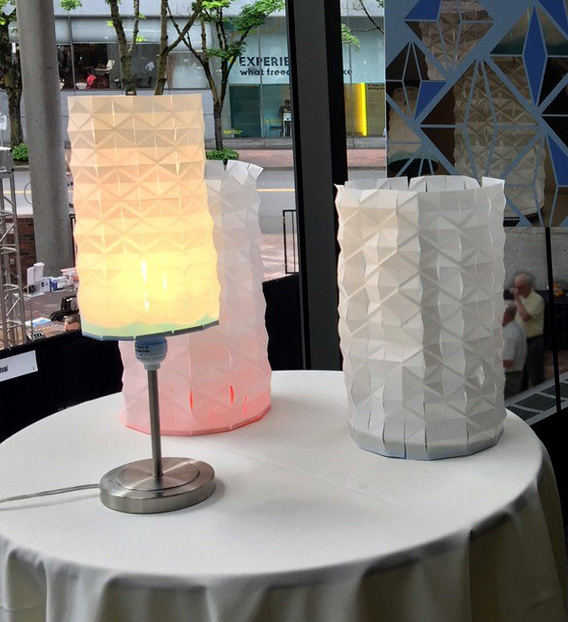 Epple designed the lamp in her Media for Design Development class, taught by Architecture Department Head and Professor Nancy Cheng. The class emphasizes parametric variations. You can view additional class designs online. The fixture was displayed during the IES Conference at the World Trade Center, where the award was given last June. IESOR Scholarship Chair Mark Ramsby worked with Oregon professors to create the lighting design competition, and lighting designer Mariel Taviana Acevedo, past president of IESOR, provided design refinement advice to the students. UO Architecture and Interior Architecture students in the School of Architecture & Environment typically design luminaires to fit specific spaces for the Environmental Controls Systems and Electrical Lighting classes. Oregon students are eligible to submit designs for the 2018 competition, which awards a $2000 scholarship prize. The deadline to apply is April 10, 2018. Nicole Epple, an exchange student in the School of Architecture & Environment, won the 2017 Illuminating Engineering Society of Oregon James C. Garber Scholarship for her luminaire design. Epple’s lighting fixtures emerged from experimenting with how cut-and-folded translucent paper would interact with boldly colored paper.